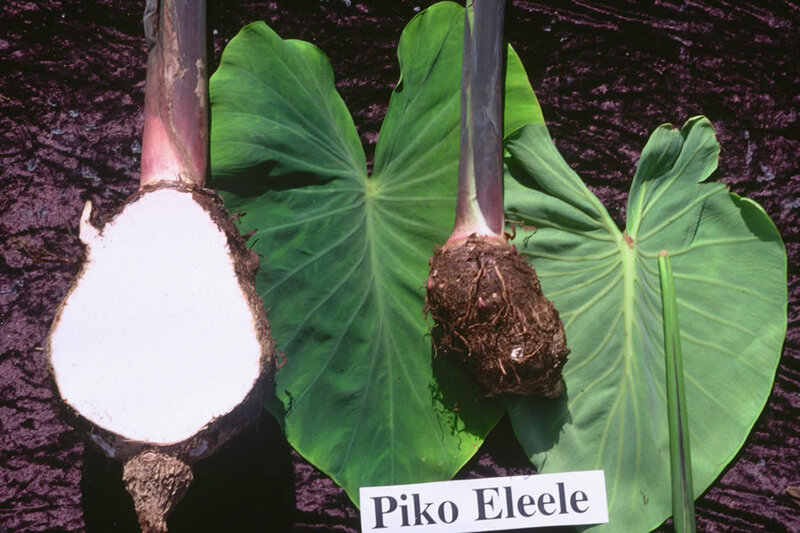 General Characteristics: Medium in height, erect, moderately stocky, maturing within 12 to 15 months, producing from 5 to 10 oha; distinguished from other Piko taros by dark purplish petioles. Petiole: 55 to 85 cm. long, reddish-brown to purplish, especially on lower half, with indistinct or narrow reddish edge and usually with adjacent dark green blotches, particularly near the base, a brilliant dark pink ring at base with light pink area flecked with light reddish-brown for 3 to 4 cm. above. Leaf blade: 35 to 45 cm. long, 20 to 30 cm. wide, 20 to 30 cm. from tip to base of sinus, horizontal, broadly sagittate tapering abruptly to sharp point, fairly firm in texture, dark green; piko light green to light pinkish; lobes obtuse with narrow sinus. Corm: Flesh white with pinkish tinge, especially near apex, and yellowish fibers; skin pale salmon-pink, often purple along leaf-scar rings. Inflorescence: Peduncle reddish-purple; spathe 15 to 20 cm. long, the lower tubular constricted portion 3 to 4.5 cm. long, green, tinged with red at base, usually partially open exposing the ovaries, the upper portion deep yellow; spadix 5 to 6 cm. long, the sterile appendage about 4 mm. long. Origin, and derivation of name: Native variety; called Eleele because of its dark petioles. Distribution: Grown either as wetland or upland taro; planted quite extensively at Kona, Hawaii, under upland culture. Use: A common poi taro; also considered an excellent table variety, and the leaves are popular for luau. Remarks: Piko Eleele does better in the upper valley areas where rainfall is abundant and the water cool; at low elevations in water which has become warm by passing through several paddies a soft starch is produced which rots readily. The name Piko Eleele is sometimes confused with Pikoele; the latter is not a Piko taro.